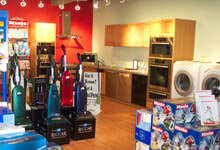 It doesn't have to be difficult finding honest, affordable vacuum repairs Andover MA. Area residents have trusted our advice for decades; so can you. Now run by a fourth-generational owner, North Shore Vacuum and Appliance offers an expertise backed by tradition. We are a reputable, local company that prides itself on our superior customer service while offering competitive rates. Neither do your vacuum repairs have to take forever. We understand how much you rely on your machine. At North Shore Vacuum and Appliance, we are fully stocked with a full inventory of replacement parts, including hard-to-find accessories, motors, hoses and more. So when you bring your machine in for vacuum repairs, you can expect service as we have the majority of what you need right here in our shop. If you're seeking quality vacuum repairs for your machine, we have the experience and tools needed to repair the following products. So for expertise and reliable vacuum repairs, Andover MA area residents should contact our shop today at (978) 774-1155.